Whether you’re on the road, in flight, or simply hiding from the seasonal chaos, there’s no better time than the holidays to catch up on your podcast listening. 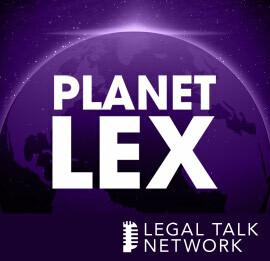 These four episodes of Northwestern Pritzker School of Law’s Planet Lex, hosted by Dean Daniel B. Rodriguez, have something for everyone – the political junkie, the book lover, the aspiring entrepreneur, even the budding cannabis attorney. Dean Rodriguez talks to the One L and Presumed Innocent author about legal fiction and his career as a writer and lawyer. Listen now. Former White House Counsel Neil Eggleston and former FCC Chairman Newt Minow given an inside look at what it’s like to work for a president, and reveal their concerns about the Trump administration. Listen now. Two industry insiders discuss the complexities of the marijuana industry, including the banking challenges facing cultivators and the battle for more research in the U.S. Listen now. Success after law school doesn’t always mean practicing law. J.B Pritzker, co-founder of the Pritzker Group, and Howard Tullman, CEO of 1871 Chicago, talk about what it takes to pursue innovation in business. Listen now.